Shepard Fairey is a name that is known worldwide for his (mostly) street-art masterpieces that are (mostly) hard to miss. He gained significant notoriety after the world caught wave of his “Hope” poster, created during Barack Obama’s campaign for president of the United States in 2008. It depicted a graphic-style portrait of then-candidate Obama, with the words HOPE in block letters—not-so-subtly echoing the sentiment of his entire campaign. Hublot is also a name that is known worldwide, but for manufacturing some of the world’s finest, luxury timepieces. 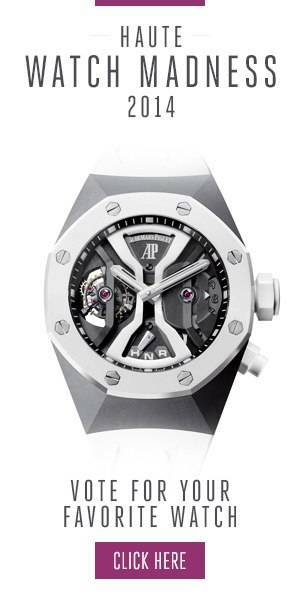 Its slogan, “The Art of Fusion,” has lent itself to several incredible watch collaborations with various artists, athletes and public figures including Lang Lang, Richard Orlinski, Usain Bolt, Floyd Mayweather and Pelé. The two brands—Fairey himself and Hublot—have come together for an epic creation in the Big Bang Meca-10 Shepard Fairey. Limited to 100 each of the two variations of the watch, both are beautifully artistic and technologically innovative designs that perfectly marry the ethos of the street artist and the watchmaker. To announce the collaboration, Hublot and Fairey hosted hundreds of guests for a new-age style party at an art studio in Los Angeles—Fairey’s hometown. Hublot timepieces were on display in lighted vitrines while Fairey’s art pieces were mounted on the walls in the oversized space. Before taking the stage to serve as the DJ for the evening, Fairey spoke briefly about the exciting project with global CEO of Hublot, Ricardo Guadalupe. The two-year development features Hublot’s signature in-house movement, a 10-day power reserve, a “gear-driven mechanical aesthetic… [and] an unusual architectural design based around a construction set, with a stylized skeleton revealing the originality of a cogwheel power reserve indicator,” according to the brand. Additionally, the watch has two barrels, and at 3 o’clock, Shepard Fairey’s Star Gear logo, which reveals a red dot when the power reserve is reaching its final days, as well as a 6 o’clock gearwheel to show the exact number of days remaining. At 7 o’clock, there is also a small second regulator with the regulating organ. Hublot’s signature “one click” technology is also part of the watch, allowing the owner to quickly swap the strap with ease. Available in black and navy blue colorways, both color options arrive in a presentation case signed by Fairey and numbered letterpress print, reading either “Star Gear Collage Red” or “Star Gear Collage Blue,” framed in concrete.